Onboard the flight were copilots Dave Mackay, who is the company's chief pilot, and Michael "Sooch" Masucci, each of whom has clocked more than 10,000 hours in the air. A third Virgin Galactic staff member, Beth Moses, who is the company's chief astronaut instructor, was also aboard. Moses, who has completed 400 flights at 0 g, was onboard to provide more data about how human bodies experience SpaceShipTwo flights and what the in-cabin experience is like for passengers. The flight also carried four payloads provided by NASA. Those experiments will provide scientists with data about the implications of microgravity on how liquids and gases interact, how payloads vibrate and how dust particles behave, as well as testing electromagnetic field sensor equipment. Today's flight was originally been scheduled for Feb. 20, but was delayed on account of bad weather in Mojave. During the company's fifth powered test flight on Feb. 22, 2019, copilots Dave Mackay and Mike "Sooch" Masucci took the VSS Unity space plane to an altitude of 55.4 miles (90 kilometers). Virgin Galactic is planning to carry space tourists on suborbital flights for $250,000 apiece. Company founder Richard Branson has said that he hopes to take his own first flight on July 16, 2019, to commemorate the 50th anniversary of the launch of Apollo 11. WASHINGTON — SpaceShipTwo successfully flew to the edge of space for the second time Feb. 22, carrying three people for the first time as the company moved closer to beginning commercial operations of the suborbital spaceplane. VSS Unity, as the second SpaceShipTwo vehicle is named, was released from its WhiteKnightTwo carrier aircraft at 11:53 a.m. Eastern, about 45 minutes after taking off from the Mojave Air and Space Port in California. It fired its hybrid rocket engine for roughly one minute, flying to an altitude of 89.9 kilometers and top speed of Mach 3 before gliding back to a runway landing in Mojave at 12:08 p.m. Eastern. The flight was the first for SpaceShipTwo since the Dec. 13 flight that was the first to pass the 50-mile (80.5-kilometer) altitude above which U.S. government agencies award astronaut wings. The company considers that the boundary of space even though it is below the 100-kilometer Karman Line used by other organizations. At the controls of SpaceShipTwo were David Mackay, Virgin Galactic’s chief test pilot, and Mike “Sooch” Masucci, the company’s lead trainer pilot. This flight was the first time that either pilot had been to space. 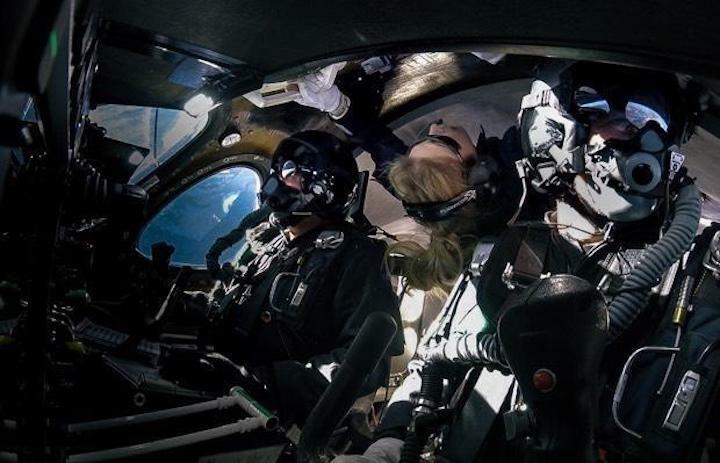 For the first time in any flight in the SpaceShipTwo test program, the vehicle carried a third person: Beth Moses, Virgin Galactic’s chief astronaut instructor. “She will provide human validation for the data we collect, including aspects of the customer cabin and spaceflight environment from the perspective of people in the back,” the company said in a tweet. The company didn’t disclose she was on the flight until after takeoff. The vehicle carried four payloads from NASA’s Flight Opportunities program, which provides suborbital spaceflight access for science and technology demonstration payloads. Three of the four payloads also flew on SpaceShipTwo’s previous flight in December, the first time the vehicle carried experiments for the Flight Opportunities program. With the experiments and the presence of a third person, Virgin Galactic said SpaceShipTwo was “at close to approximate commercial weight” on this flight. Part of the flight was also shifting the center of gravity of the vehicle to expand its operating envelope in preparation for commercial flights. Neither Mike Moses nor George Whitesides, chief executive of Virgin Galactic, would say how many more test flights the company plans before beginning commercial service. “We’re still in the heart of the test program,” Moses said, with the number of flights dependent on how long it takes to meet all of the requirements of the overall program. Richard Branson, founder of Virgin Galactic, said after the December flight that as few as three more flights would be needed before operations shift to Spaceport America in New Mexico. He subsequently said he anticipates being on the first commercial flight of the vehicle this summer, perhaps around the 50th anniversary of the Apollo 11 mission in July. Two test pilots and their instructor flew Virgin Galactic's winged spaceplane out of the discernible atmosphere Friday for the second time in nine weeks. The successful sub-orbital flight moves Richard Branson's company one step closer to its goal of launching paying passengers and payloads on brief forays into the weightlessness of space. Running two days late because of high winds, Virgin's SpaceShipTwo rocketplane, also known as VSS Unity, was carried aloft from the Mojave Air & Space Port north of Los Angeles by a twin-fuselage carrier jet known as WhiteKnightTwo. After the air and spacecraft were off the ground, Virgin Galactic revealed that chief pilot Dave Mackay and co-pilot Mike "Sooch" Masucci were joined by Beth Moses, the company's chief astronaut instructor. A few minutes later, around 11:50 a.m. ET, SpaceShipTwo was released from the carrier jet and a few moments later, Mackay and Masucci ignited the spacecraft's hybrid rocket motor to begin a steep near-vertical climb out of the thick lower atmosphere. It was the fifth supersonic flight of the futuristic-looking spaceplane and the 16th overall since a catastrophic 2014 in-flight breakup that destroyed an earlier version of the spacecraft and killed one of its two pilots. Friday's flight was the company's second featuring a long-duration rocket firing. Virgin Galactic pilot Dave Mackay, right, and co-pilot Mike Masucci, left, monitor the controls of their rocketplane while chief astronaut instructor Beth Moses floats in the cabin. Branson, who was not on site for the test, said earlier he hopes testing will be complete in time for him to fly into space himself on July 20, the 50th anniversary of the Apollo 11 moon landing. But he said meeting an arbitrary target will not drive the test schedule and that commercial operations will not begin until all aspects of testing are complete. "Having Beth fly in the cabin today, starting to ensure that our customer journey is as flawless as the spaceship itself, brings a huge sense of anticipation and excitement to all of us here who are looking forward to experiencing space for ourselves," Branson said in a statement. "The next few months promise to be the most thrilling yet." Friday's flight appeared to go off without a hitch as the pilots guided the vehicle out of the discernible atmosphere. The rocket motor shut down normally about a minute after ignition and the spacecraft coasted upward at a Virgin record 3.04 times the speed of sound to an altitude of 55.87 miles, or 295,007 feet. For comparison, NASA pilot Joe Walker flew the air-launched X-15 rocketplane to an altitude of 67.1 miles on Aug. 22, 1963, the highest point ever achieved by the legendary aircraft, 17 miles above the 50-mile altitude the Air Force considers the "boundary" of space. 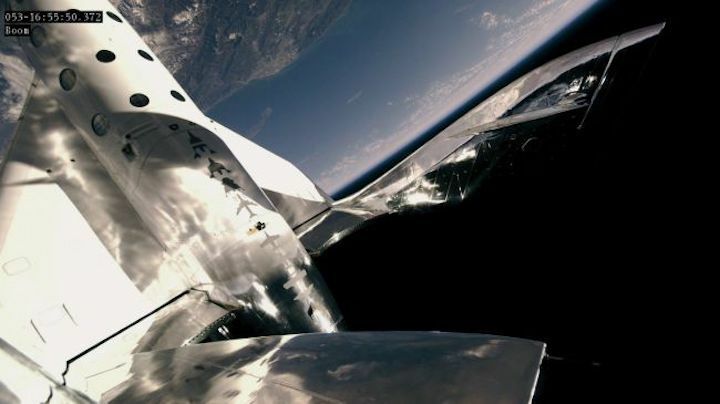 SpaceShipTwo made its first trip into space on Dec. 13, reaching an altitude of 51.4 miles. The two pilots, Mark Stucky and C.J. Sturckow, a former space shuttle commander, were awarded commercial astronaut wings by the Federal Aviation Administration and their rocket motor was put on display at the Smithsonian's National Air and Space Museum. Mackay and Masucci flew a similar flight profile Friday, but SpaceShipTwo was rigged more like it will be or commercial flights and the motor fired slightly longer, pushing the vehicle to a higher altitude. And they had a passenger of sorts in Moses. As the spacecraft arced over at the top of its trajectory, the crew experienced about five minutes of weightlessness as they enjoyed a view of Earth's curved horizon and the deep black of space. Moses had time to unstrap and float about the cabin. "Beth floated free to complete a number of cabin evaluation test points," Virgin said in a post-flight statement. "The human validation of data previously collected via sensors, and the live testing of other physical elements of the cabin interior, are fundamental to the provision of a safe but enjoyable customer experience." Before plunging back to Earth, the pilots raised the vehicle's twin tail booms to an angle of 60 degrees, a maneuver known as "feathering," that increases atmospheric drag and eases aerodynamic stress. "Beth, Sooch and I just enjoyed a pretty amazing flight which was beyond anything any of us has ever experienced," Mackay said in a statement. "It was thrilling yet smooth and nicely controlled throughout with a view at the top, of the Earth from space, which exceeded all our expectations. "For the three of us today this was the fulfillment of lifelong ambitions, but paradoxically is also just the beginning of an adventure which we can't wait to share with thousands of others." The feather concept was the brainchild of legendary aircraft designer Burt Rutan. With financing from Microsoft co-founder Paul Allen, Rutan's company at the time, Scaled Composites, carried out the first privately funded sub-orbital spaceflight in 2004 to win the $10 million Ansari X Prize. Branson then arranged to use a scaled-up version of the design and founded Virgin Galactic, which eventually took over development and commercial flight operations. During Friday's flight, the feathering procedure worked normally and after rotating the tail booms back to their normal position, Mackay and Masucci flew a normal gliding approach to a runway landing back at the Mojave Air & Space Port. "The team's overriding priority is always to bring crew and spaceship home safely," Virgin said in a pre-flight statement. "Whether we complete all our objectives during the next flight or not, we remain committed to completing the final stages of flight test as quickly, but more importantly as safely, as possible."